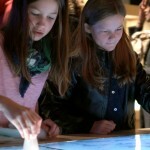 In May 2015 the Auckland Museum launched a unique touch table application, Collect & Connect, that was the result of nearly a years worth of work. 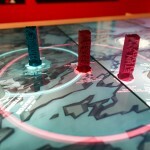 The first of its kind in NZ, the table featured in the Taku Tamaki – Auckland Stories exhibition allows multiple visitors to explore the Museum’s digital collection in previously unseen ways, using physical objects placed on the surface as an interface to access digital content. Visitors are stepping into the footsteps of a curator to uncover collection objects to match a specific theme – pretty much like a real curator at a museum would. 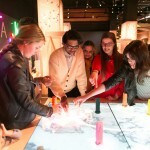 The experience is built using the game engine Unity3D and the Museum partnered up with NZ-based developers Flightless to create a cutting-edge digital experience with awesome looks and exciting gameplay that resonated especially well with our younger visitors. 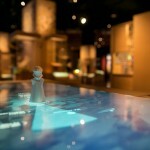 The table utilises Auckland Museum’s Collections Online API to expose records straight from the underlying collection management source systems, and was the first onsite interactive application to make use of it. 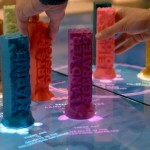 It provided a unique way of playfully accessing the Museum’s collections data in a very visual and graphic way that was very different from conventional search / browse interfaces. Collect & Connect Table at Auckland Museum. 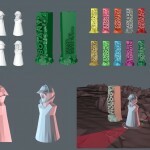 3D printed department markers. 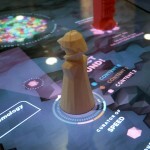 Collect & Connect Table at Auckland Museum. 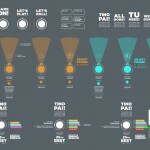 UI elements. 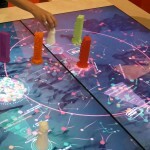 In many ways this project was a ‘first’ for Auckland Museum, including a human-centred design approach that involved using Design Thinking methodology, using the API onsite, utilising an object-recognition touch table, and building the experience in the Unity 3D gaming engine. We see evidence of the success of the project in the quality and level of enthusiasm the Collect and Connect table generated. 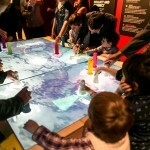 No doubt, the Collect and Connect table was a major drawcard within the exhibition – 67% of visitors stopped to use it, with both adults and children intrigued at first sight. 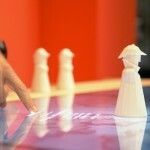 It’s visual attractiveness and contemporary/digital nature was key – prompting visitors to have a go. 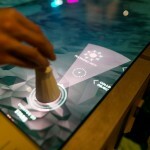 Children in particular thoroughly enjoyed having a go on the table and were impressed to find a high-tech activity of this nature at the Museum. 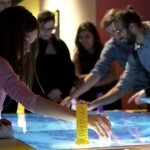 As a game it was appropriate for the target audience age range (9-12 years) and prompted intergenerational engagement – both parents encouraging excited children to slow down and read and children helping parents with technical aspects or encouraging them to be more experimental and ‘hands-on’.